The athletic Stair Dance showcases Robinson's inventive style and was featured on Broadway in "Blackbirds of 1928." Robinson performed a version of his signature piece as a duet with Shirley Temple in "The Little Colonel" in 1935. Also featured in "Blackbirds of 1928," this number is classic Bill Robinson, highlighting his light and elegant style. Our version is a small chorus piece with the same emphasis on elegance and ease. George Burns learned this vaudville piece from the choreographers and he was delighted when they gave him permission to teach the piece to Fred Astaire for the 1937 film "A Damsel in Distress." Originally performed on screen by Fred Astaire, George Burns, and Gracie Allen, this comedic piece is an audience favorite. The original was the famous production number from "Gold Diggers of 1935" that featured a huge cast of tap dancers. Our smaller cast version features the same quick steps and syncronized patterns. We loved performing it with student dancers from CPMA Middle School. Duet from "The Littlest Rebel"
A charming duet from "The Littlest Rebel," this piece was one of many Shirley Temple and Bill Robinson film partnerships. This delightful duet from "The Black Network" was a showcase for the charm and style of the youthful Nicholas Brothers. The lively classic duet was first performed by Fred Astaire and Eleanor Powell in "Broadway Melody of 1940." Affectionately known as the slowest softshoe, this duet is pure elegance. Our version is charmingly performed by the mother/daughter duo of Nancy Boskin-Mullen and Adi Mullen. "The Barklays of Broadway" was the tenth film Fred Astaire and Ginger Rogers made together and this lively number from the film is a favorite duet of many tap dancers. This sweet duet from "On the Town" featured Gene Kelly dancing with the talented Vera Ellen. This whimsical sand-dance number from "The Belle of New York" showcased the precision of Astaire's technique. Gene Kelly and Donald O'Connor performed one of our all-time favorite duets in this comedic piece from "Singin' in the Rain." This intricate work is quintessential Eddie Brown, known for his "scientific rhythm." Pam Thompson-Spinner, protégé of the late, great, tap master, learned the steps first-hand and passed them on to the Company. Created as a teaching routine, this elegant tap composition embodies Collins’ signature melodic style. Gene Kelly joined Frank Sinatra as his guest in the television special nicknamed "Ol' Blue Eyes is Back" after the album Sinatra had released a month earlier. This lighthearted piece showcased Kelly's elegant style. Originally choreographed as a tap solo in an evening length modern dance piece, dancers’ gestures convey a sense of merely going through the motions. Choregraphed to the Rimsky-Korsakov classic, this dance is a delightful study in speed and clarity. The piece is another example of Collins' groundbreaking bebop style of tap dance, with free-form rhythms that follow the melody instead of simply holding the beat. This piece is a tribute to one of Thompson-Spinner's teachers, Louis DaPron, based on his famous warm up and on other classic Louis DaPron steps. Performed to a swinging up tempo version of the title song from the 1944 film "Laura," this Paddle and Roll number is Buster Brown's signature piece. Originally titled "Cole's Cuts," this piece was created at the 1990 Dance Umbrella Jazz Tap Festival in Boston and premiered at The Great Tap Reunion a week later. This Appalachian clogging style dance premiered at Thousand Oaks Civic Arts Center in a performance by AMAN Folk Ensemble. Fast footwork and joyful partnering make it an audience favorite. D3 is Thompson-Spinner's homage to her mentors and teachers. Woven throughout the choreography are rhythms and themes inspired by Eddie Brown, Fred Strickler and Stan Mazin. Inspired by Savion Glover and Keith Terry, this piece features quirky, off-beat rhythm changes and incorporates vocalizations. The piece was most recently accompanied by original poetry that was written and spoken by Ernie McCray at the 2014 San Diego International Fringe Festival. Tap dancers play with the rhythms of the Philippines in this tinikling-inspired piece. Bamboo poles set the beat while dancers leap in and out of the moving sticks. 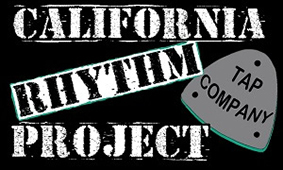 Choreographed for California Rhythm Project, this body music piece in 12/8 time is an exploration of rhythm and "the body as a beat box." This gospel music inspired piece features a vibrant cast of characters in Sunday hats and dresses. Friends greet one another, a little girl plays pranks and small groups of dancers blend into a larger whole as they all make their way to the meeting place to join in dance together. True love is hard to find and even harder to keep, but that doesn't stop a young man from trying in this duet inspired by Berkley Hart lyrics. A wandering band of dancers circles the stage in a Cuban flavored tap number. In a dance shaped by the traditional music of the island nation, chugs and digs play the drum beat for this lyrical voyage through Latin rhythms. Originally choreographed as a "rock the vote" number with a retro groove, each dancer in this quartet has the chance to make her voice heard. Later versions feature a larger cast and the piece rolls its way to a rousing tap jam finale. A dynamic fusion of tap rhythms and street sounds. Dancers create a collage of beats as they start their early morning work day. In this piece, a jazz beat is overlaid with complicated rhythms, from bolero to swing with steps inspired by Eddie Brown and Honi Coles, culminating in a sand dance in the style of Sandman Sims. A trio of dancers plays with rhythm, riffs and crawls accompanied by an a cappella version of Stevie Wonder's "Overjoyed" mixed with a traditional Brazilian melody. This piece premiered at Mesa College and is part of a suite of dances created in memory of the choregrapher's father. It was inspired by his love of all kinds of music, and by memories of music the family played at home during her childhood. Boy meets girl in this elegant duet inspired by the iconic stair dances of Bill “Bojangles” Robinson, Shirley Temple, the Nicholas Brothers, Fred Astaire & Ginger Rogers. A new romance blossoms as our dancers play with variations on a theme. An ever-increasing tempo drives this Broadway style number. A coffee cart line transforms into a chorus of riffs and stomps as dancers chase a caffeine rush. A playful mix of taps, percussion and live vocals. This exuberant slice of life number is a playground romp as hop scotch, jump rope and basketball dances are interspersed with body music and variations on classic rhythms. A charming blend of tap dance and classical Indian dance, this piece is a study of univeral rhythms. Traditional tap dance and traditional polynesian dance are combined in this fun mix of rhythmic dance genres. Created for California Rhythm Project by world-renowned tap star Chloe Arnold, this salsa-inspired piece thrills with fast footwork, hot music, and latin style. Complicated rhythms drive the tempo of this emotionally intense flamenco piece choreographed for California Rhythm Project by Kristina Cobarrubia of Flamenco Arana. This high spirited piece combines West African rhythms with the toe-tapping sounds of rhythm tap.